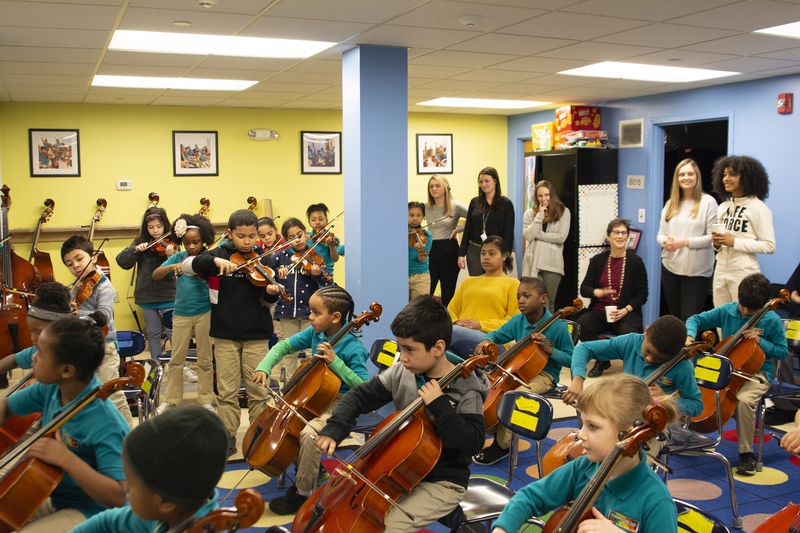 Esperanza Spalding’s visit to Conservatory Lab was a magical moment for students as well as the adults who teach them music on a daily basis. 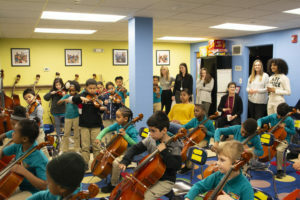 She met the second grade orchestra named for her. 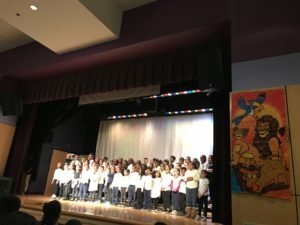 She talked about the trust and freedom she saw in their eyes — something in short supply in most schools today, particularly under-resourced urban schools. That brief visit led to another- from a principal in Washington DC, Eric Bethel. Now we are starting to form an “Esperanza Network” of schools that want to use the arts as a lever for change. 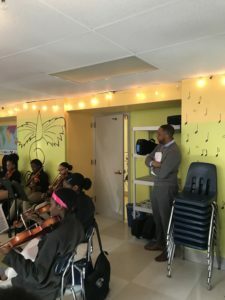 I have dreamed of an arts pathway in Boston for a long time—with BAA, Orchard Gardens K-8 Pilot School, Lilla Frederick Pilot Middle School and Conservatory Lab (CLCS). After meeting Esperanza, I’m determined to create a national network of schools and leaders who understand the deep connections between arts and creativity and the role of student voice and agency in creating change in their community. The words of El Sistema founder José Antonio Abreu always echo in my mind: tocar y luchar. To play and to struggle. I love the double meanings of these words. Play can mean play an instrument, but it can also mean play as in have fun or find joy. And luchar is a powerful word that connotes struggling for what is right. Students in our Esperanza Network need to know and understand that concept. We know art and beauty are paramount for healthy development. We also see that our young students (and their families) increasingly come from environments where trauma (racial, socio-economic, health, environmental) is the norm. This reality makes daily art making an even more important experience. An education steeped in creativity helps students understand and articulate future possibilities. If students are continually immersed in making and doing and their curriculum regularly asks them to make suggestions and even decisions about how to improve their lives and communities, then we can ensure a healthier and more engaged public. The Esperanza Network will celebrate artists-scholars and leaders. These will be leaders who understand that they have a role and responsibility to improve their communities. I saw those artist-scholars-leaders on stage the other day at Orchard Gardens K-8 Pilot School (OGPS), where I serve on that school’s governing board. We gathered recently with city and school officials to discuss plans to prevent hypodermic needles from landing in the play and green spaces surrounding the school. New fencing will deter people from tossing needles over the fence and endangering children. Needle kiosks will be installed near the school to encourage the safe depositing of needles. We (parents, board members and students) all recognized that these are stopgap measures, and that treatment facilities are truly the key. Students have also suggested that another way to improve their school would be to have a better playground. That way, they said, people will be more careful about what they throw away and where. In a return this week to OGPS for their Spring musical, I was moved by the 50-minute extravaganza that included theatre, dance and instrumental and vocal music by many different grades. Some of the work was choreographed by the young people themselves! 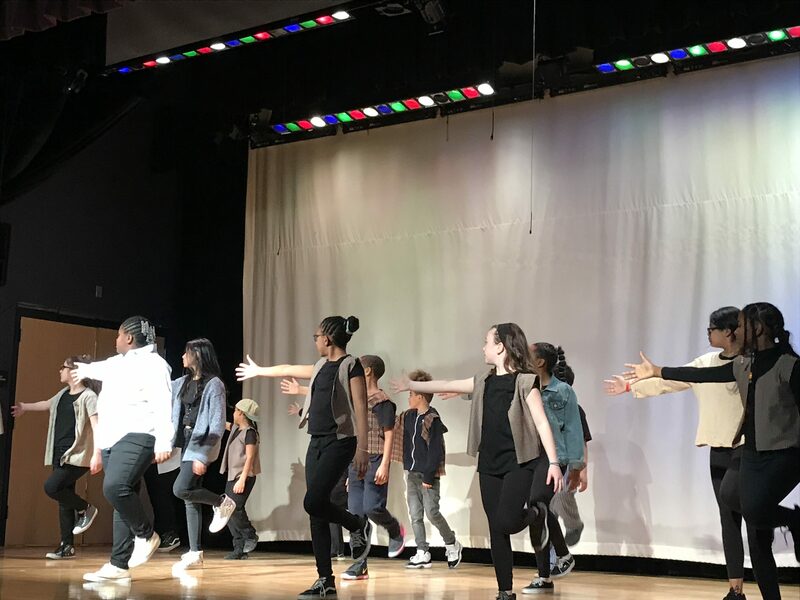 The range of students on stage was great to see — some performed alongside their special education aides who were having as much as fun as the youngsters. No matter their level of artistic expertise, everyone had a great time and supported one another. Almost 25% of OGPS 8th graders are admitted to Boston Arts Academy and I could see why! Bravo to all the teachers, administrators and young people who work so hard there every day and show such hope and resiliency at the same time. I wonder what schools would like look if we had assessment criteria that wasn’t just high- stakes testing. Remember the idea that MCAS would be a system (even a portfolio!) of ‘high stakes’ experiences? Imagine if to graduate from middle school and high school all students had to do a capstone that either informed a community-based issue (like BAA’s senior project) or celebrated artistic expression like at OGPS or interrogated a community problem as students at CLCS do. Maybe we need to figure out how to measure creativity in order to get out from under the oppressiveness of testing, testing, and more testing. So little evidence exists on how all this testing has led to greater opportunities for young people. In fact, “The Achievement Gap Fails to Close“, a recent study done by Eric Hanushek–who has long championed standardized testing, concluded that achievement has not risen in the last 50 years despite the last two decades of testing mania. Too many systems have continued to narrow the curriculum and shut out experiences that make school and learning truly engaging. Perhaps the Esperanza Network can create a School Quality Measurement System that values the whole child’s range of experiences, including ways to instill hope. I’m ready to start!